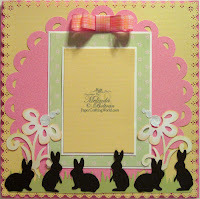 Welcome to the Hippity Hop Blog Hop and Challenge with the Creative Cutter Room! Visit each of the following 4 Design team members, find the required element from each DT member and submit your project at Creative Cutter Room for a chance to win a prize! And what is the prize? How about an April Showers Cricut Cartridge! Here are the 4 blogs to visit and get the "element" for the challenge. Here is my project for your inspiration. It is made with all four required elements. Here is a close up of the flowers, bunnies and grass. This layout is what I call a “One Hit Wonder” …lol. That means I used only one cartridge for all the die cuts. I did use my Gypsy to weld the grass together but if you don’t have the “G” you can always cut the grass out and just adhere them right next to each other. The cartridge I used was the Easter 2010 cartridge. The scalloped CIRCLE, the flowers, the bunnies and the grass all came from that cartridge. The YELLOW background paper was punched with a Martha Stewart Punch Around Set. Lastly I added just a touch of RIBBON to the top and a dash of GLITTER to the flowers. Pretty simple layout. Thanks for stopping by and be sure to head over to the other blogs and enter the challenge! This is really pretty. I love the bow at the top! What an adorable page layout! This LO is so pretty!! Melin, this is so pretty. You really are an amazing talent. Madison has been encouraging me to be more active with my crafting so I am going to enter this challenge! I hope I don't embarrass her! So pretty Melin! and yeah, one cart! your site rocks!! am excited to come up with a project with the items mentioned!! your layout is adorable ! Love all those chocolate bunnies! Oh this is just gorgeous! I love the bunnies! You always amaze me with each creation you share! Thank you so much for all the inspiration! Your layouts are always just so beautiful. TFS! I am off to do my project! Oh, so pretty......Love it! I am also a new follower if yours today. Would love for you to hop over to my blog and check it out:)Can't wait to see all your creations!!! Wow love it!!! I'm so impressed with all of the creative ladies on this hop!!!! One day hopefully I will be able to measure up!!! So pretty! 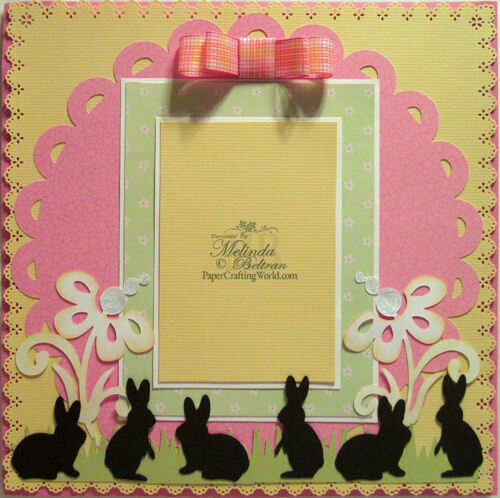 Love all the cuts from Easter 2010 and the punched edges! Oh, this is so pretty! I love that circle...and the bunnies are just adorable! TFS! It's lovely, love the colors and bunnies! This is super! I love the black silhouettes against the fresh, spring colours! Lovely page!